Way back in August I showed you the birthday room reveal we put together for my daughter. It’s been a few months since then and I wanted to do an update on how things are going, specifically how the new furniture we got is holding up. 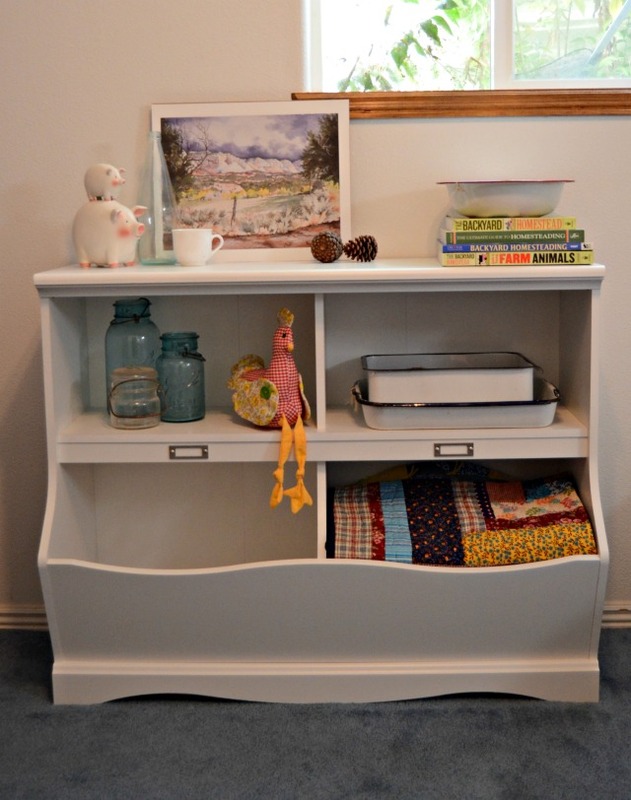 I picked out a few pieces of furniture from the Sauder’s website (this bookcase and this toy chest) and in the middle of the night we took down a baby crib and put together a whole new room for my daughter. We moved her from her old bedroom into her new one while she was sleeping and she woke up in her brand new room on her birthday. Actually that was the plan but it didn’t go quiet like that. You’ll have to read the first post to see what really happened. Regardless of where May woke up, it was such a great surprise and she has really enjoyed having a space of her own. 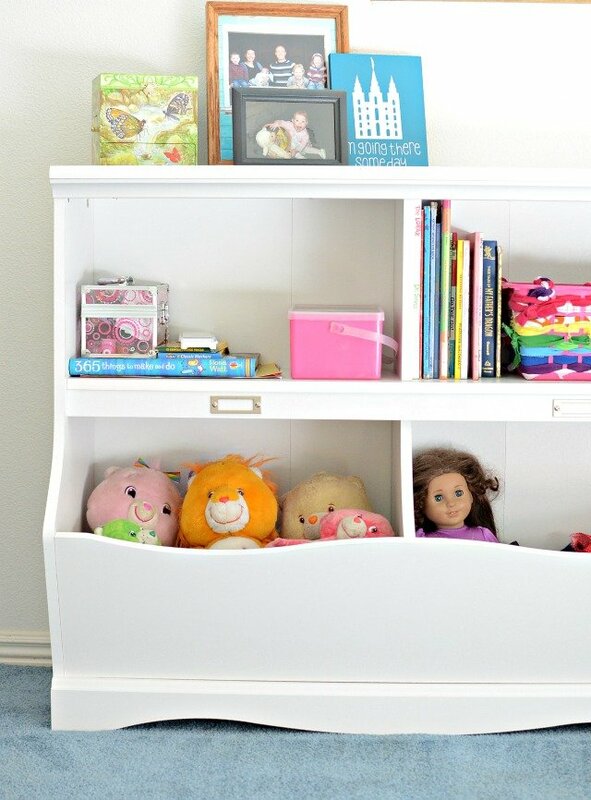 Here’s what the bookcase looks like and how we use it in her little girl bedroom. My friend Emily pointed out that the bookcase is much larger than the pictures make it look. It’s a big piece of furniture that has great storage. Every thing has held up very well. I was a little nervous that the white would scratch or chip, but so far so good. I also wondered how the lid to the toy chest would hold up (little feet stand on it often) and if it would pinch fingers. Again, so far so good! The finish on the furniture is nice and sturdy and is handling normal wear and tear nicely. Part of the deal for getting the furniture was that I would style it in a few different ways to get your creative juices flowing. I’m not a big decorator and this really had me nervous. 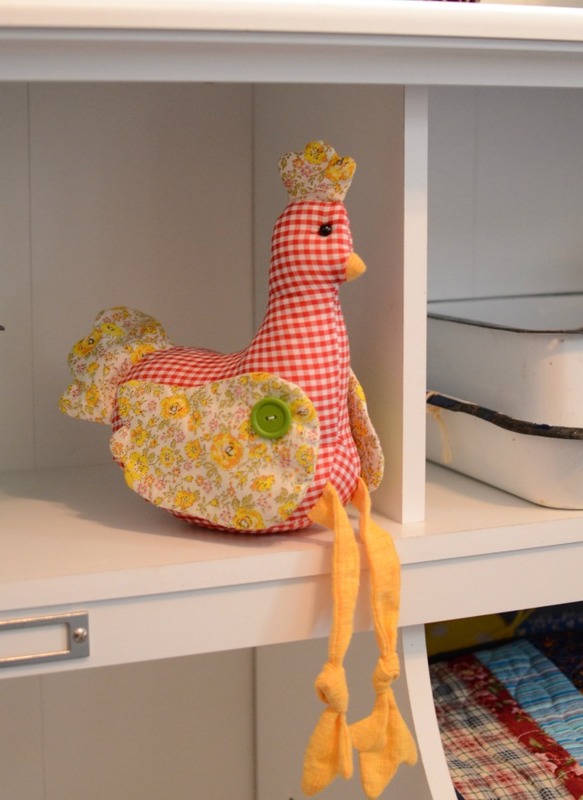 It was easy to add Macey’s things the first time around because it was her room, but more than that intimidated me. Once I got thinking and started playing with ideas it was so much easier than I thought. The bookshelf is unique in the fact that it has two bins of sorts on the bottom that are great for storage. 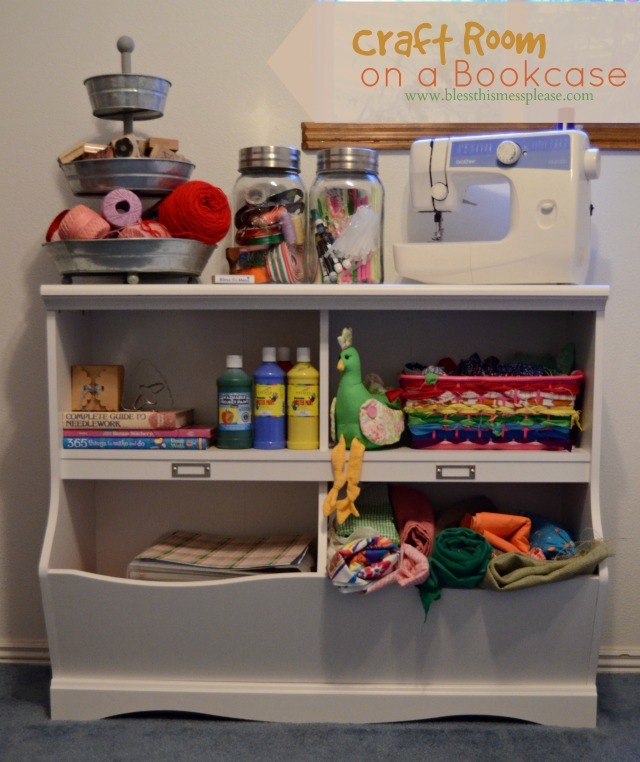 My first idea was to use all that storage and to make a little craft room out of one bookcase. We have moved 11 times in the last 9 years and this is the first year that I’ve had enough space to have a craft/sewing/catch-all room to call my own. In houses past I just had my kitchen table or my bedroom. 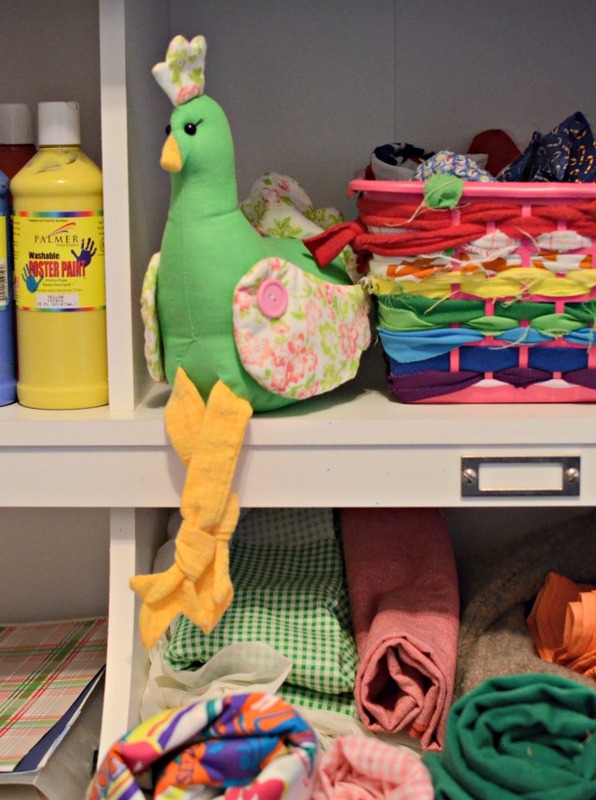 This craft room on a bookshelf is the perfect way to designate a creating space without having to dedicate a whole room to it. I tend to get more projects done when they are sitting out for me to notice. 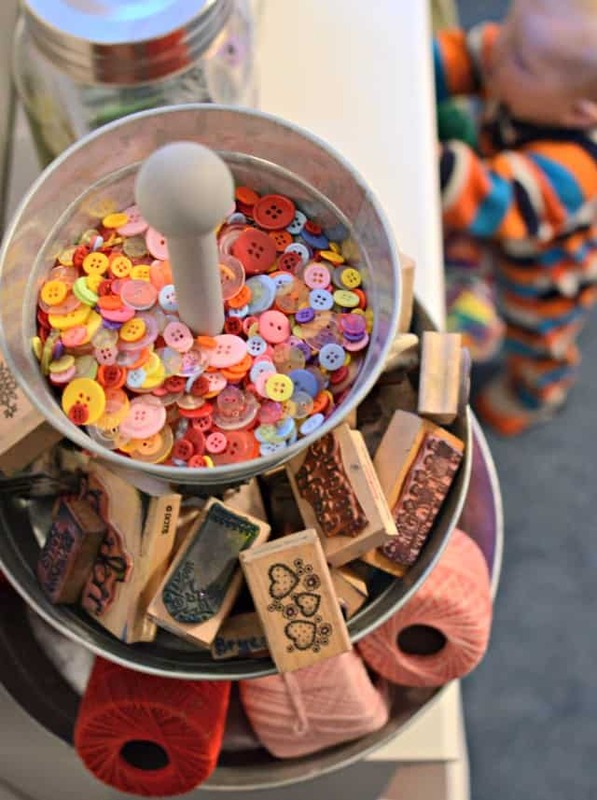 I also adore craft supplies and am often very inspired by them. 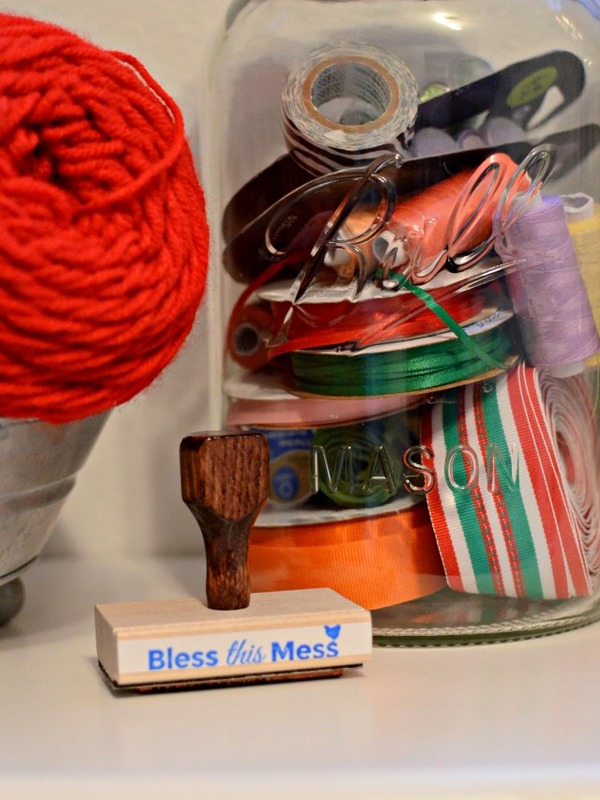 Having some of your supplies out in the open and used as practical decor might help you get more things done! On a side note, her room is tiny, like 8 feet by 8 feet or something and it’s really really hard to get a picture of the bookcase that looks decent (it’s also in the basement), so please excuse the less than perfect pictures. The bins at the bottom are just perfect for holding material or paper. Another fun idea I had for this bookcase was to use it in a guest bedroom. I was thinking about the day that I have a guest bedroom and I decided that that room probably wouldn’t need a dresser. I never unpack my bag when I stay at someone’s house or in a hotel and dressers in those rooms seems like a waste of space. It is nice, however, to have a place to set things down besides in your bag or suitcase. 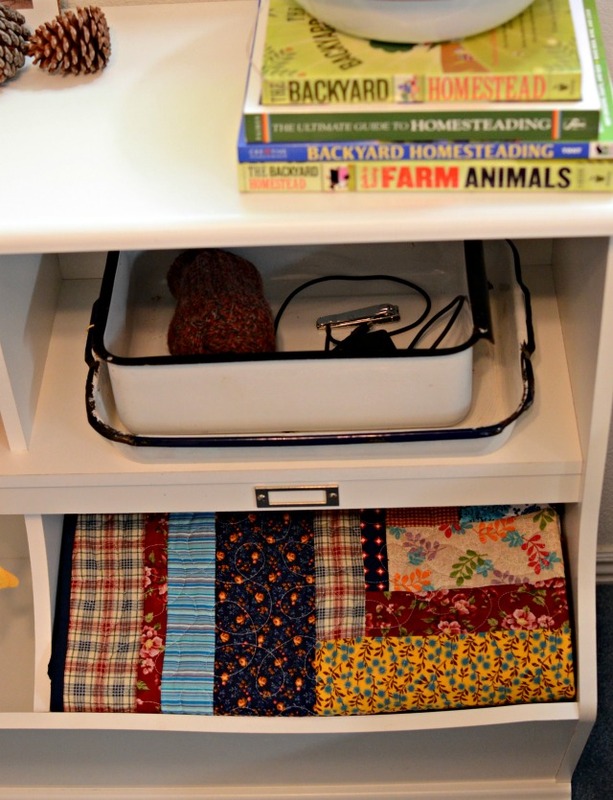 This dresser is kind of a best-of-both-worlds because of those storage bins. Your guest could put a few things in and also have a place to set their glasses at night. When I got this idea ready I imagined my friend Becky coming to my house to stay or me going to her house. Often when I travel I forget a few things like my phone charger or nail clippers. I’m sure I’m not the only one who does this, so having a little stash of extra things ready for your guest will make them feel at home. A nice pair of wool socks and a bottle of water and cup are also nice touches. A few extra blankets and a pillow are practical but pretty. Add some great reading material and they’ll never want to leave. 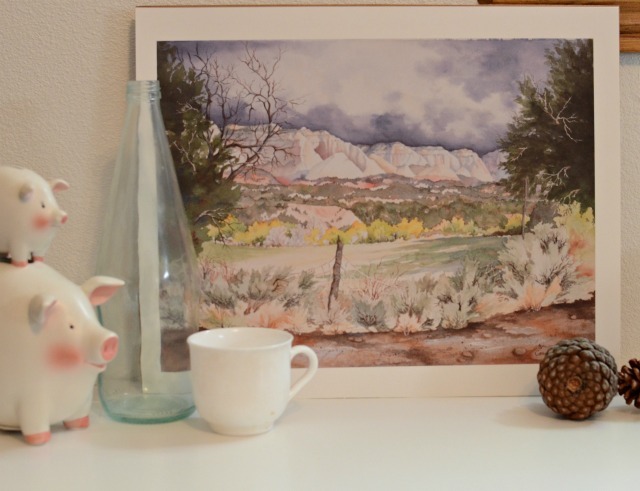 I thought this painting of White Mountain (which is right outside our house) was a perfect, local, personal touch. My friend Connie painted it and I love it. There you have it! Three different but pretty ways to use that same piece of furniture. I have a catch all Pinterest board for my dream house and some of the pins are a lot like this, creative ways to use furniture. 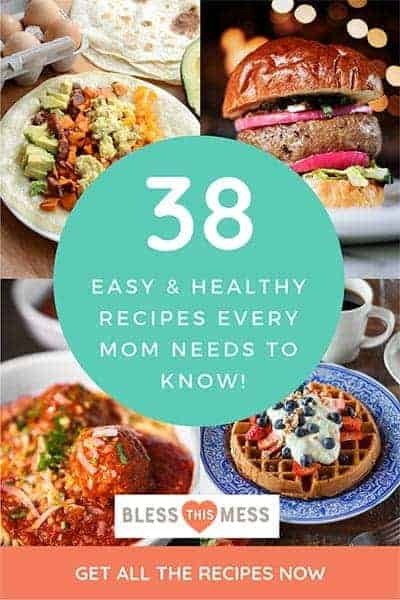 I thought you might like to check it out! I get on this board and let myself dream anytime I feel like we might never live in a house of our own. One day it’ll happen and when it does it is going to be grand! 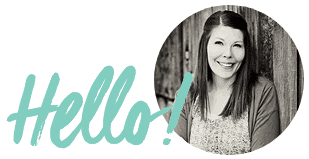 Follow Melissa @Bless This Mess’s board Living the Dream – one day on Pinterest. And a big thanks to Sauder’s for helping me get my daughter’s room put together. I loved that the furniture just came in the mail and that fact made pulling it off as a surprise totally possible. Oh I love the guest room pictures. I especially love that you have my mom’s picture on display. Isn’t she an amazing artist? She’s pretty amazing all around, the art I just get to enjoy all of the time 🙂 And you blog is lovely!! You should be so proud of it. And now I want to homeschool my babies. Oh Thanks for your kind words. I really need to quiz you down on blogging when I come down next time. I love your blog! This is great! Love that piece!